This cake is adapted from one attributed to B. Smith, a fashion model who parlayed her career into that of a restaurateur. In my teens, I had the pleasure of meeting her one day when my aunt and I stopped by her new restaurant. I wish I could say she handed me this recipe that day, but nope — I only met her briefly, and she was very sweet. I found this on Epicurious years later and it’s one of my favorite versions of red velvet cake. I’ve modified it a bit over the years and played with the ingredients, but I always come back to this one which is close to the original. The trick is to sift your cake flour before measuring OR weigh it out. If you use too much flour, the cake will be dry. Preheat oven to 350 degrees. Spray two 9-inch round pans with flour added cooking spray or rub with shortening and dust with flour. Sift together cake flour, cocoa, baking powder, baking soda and salt; set aside. Mix buttermilk, food coloring, vanilla and vinegar in small bowl or large glass measure; set aside. Beat sugar and butter in large bowl, using an electric mixer, until light and creamy. Add eggs 1 at a time, beating until well blended after each addition. Add 1/3 of the flour mixture and stir until blended. Stir in half of the buttermilk, then another third of the flour mixture. Stir in remaining buttermilk and finally, remaining flour mixture. Stir vigorously until lumps are gone or beat on low speed of mixer. Divide batter between pans and bake cakes on center rack for 25-28 minutes or until a wooden skewer inserted in center comes out clean. Cool in pans on racks 10 minutes. Turn cakes out onto racks; cool completely. So sorry I never left a comment here about this cake after I actually made it. It was a big hit! Now I’ll have to try your family’s favorite Red Velvet Cake that you linked to in your layer caker post today. I’m considering making this cake for a group of friends that will be here for lunch on Wednesday. How do you think it would be if I made it one day in advance? Ever since you posted this I keep thinking about red velvet cake and while we definitely do not need more baked goods right now I wonder if I could use less food color by using the more concentrated gel? Maybe it wouldn’t work, and I’m probably just kidding myself about there being less food color. There would probably be the same amount but it would be more concentrated. Yay! I just came looking for a red velvet recipe, I’m to bring a red velvet cake to Christmas Eve at my mother’s. At the beginning of the month, I made some red velvet cupcakes (from a McCormick recipe) to take to a PTA meeting. They were very good. This will be my first attempt at a cake though…I’m worried about making the frosting, I sometimes have trouble with frosting! Maybe I should have some canned on standby! You’re right, Anna. 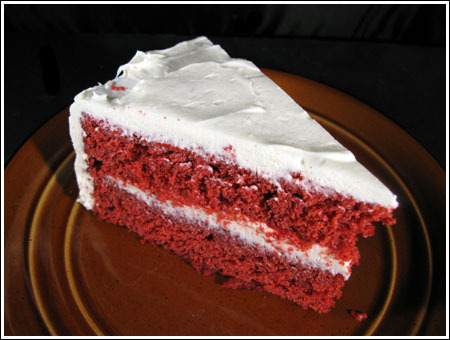 Red Velvet Cake definitely has it’s own distinct flavor. My son isn’t a sweet eater at all, yet Red Velvet Cake is his favorite, when asked what kind of birthday cake he wants. My absolute fave!! I visited a cupcake bakery recently where I picked up, yes… a red velvet cupcake. Love the stuff. Mmm, I love red velvet cake, and yours looks divine! Red velvet cake always makes me think of a recipe from an older Southern Living magazine (I want to say Dec. 1998?) involving a marbled-ish case with red velvet and white cake swirls, topped with frosting and sprinkled with peppermint bits. Mmmm. I never made it, because my mom poo-pooed the idea (she’s a mint-hater like you! ), but I think perhaps it’s time for me to do so. I have to say, I also love red velvet cake. I think it’s the cream cheese frosting combined with the deep red color. I’m actually not sure if I’ve ever made it, though! I read that the red coloring used to be a bit more natural. Apparently, “the reaction of acidic vinegar and buttermilk tends to turn the cocoa a reddish brown color,” and today’s cocoa isn’t the same as it used to be. I don’t know how accurate this information is, but it’s interesting! I heart red velvet cake. Every red velvet I have ever had (until my cupcake expedition) has always been a chocolaty flavor! I always thought that was why there was soooo much red food coloring in it. I made one not too long ago and the recipe had such a little amount of cocoa powder, so I put more and didn’t use any more food coloring, and it was still bright red! I love it!!! It seems that the red velvet cake is the rage right now…maybe because of Christmas. I haven’t had the cake in many years, but recently had a Red Velvet Cupcake that was good. I don’t think I’ve seen a recipe for red velvet cake with butter in it before, they seem to always use oil. I made my first one about a month or so ago, pretty much using the recipe you previously posted, with the cooked buttercream frosting. We liked it a lot. I’m curious to try this one with the butter. Katrina, Better Homes & Gardnes had red velvet whoopie pies in their last issue. Maybe your family would eat those. The recipe should be on their website. Amy, that’s why I like you! Amy, thanks for reminding me about MS’s recipe. I will definitely check. Meanwhile, I should probably put all the red velvets in category. Sue, I would have demanded a refund….or at least a free cake. I know what you mean about how it really takes talent to decorate. If I wasn’t so busy baking cookies, I think it would be fun to team up with someone and do they baking while they do the decorating. I don’t remember the last time I had red velvet cake. Maybe in high school? I know I liked it well enough to ask my friend’s Mom for her recipe because after all of these years I still have her recipe in my recipe box with my high school handwriting. She called hers Flame Cake but I think it’s essentially the same thing. Last year when my daughter graduated from ASU and my son graduated from h.s. I ordered two bakery cakes to honor each of them at the big party. The daughter’s cake was supposed to be red velvet cake. I thought it would be appropriate to have her school colors in her cake not just on it. My dear friend helped me out with the party and she cut the cakes for serving. She was cutting from each cake and serving and suddenly she realized they were both white cake with different decorations on the top! She knew they were supposed to be different. I found out later that the bakery had run out of red velvet cake mix so they just went with what they had! It would have been nice if they had phoned so we could have made a different choice, but all in all it was no big deal. If I would only take the time to learn to decorate I wouldn’t ever order another bakery cake. Homemade cakes are so much tastier. Bakery cakes are so much prettier. I’m glad that Todd’s cake was a success! If I ever make it I’ll try out this recipe. I love red velvet cake. I grew up loving it and still do. I, too, have never tried red velvet cake and have always been intriqued by it. Love your description of how it tastes! Too bad my family doesn’t like cake! First off, I LOVE Mac lipstick. It tastes like sweet plus vanilla plus cake plus moist plus twang plus a *hint* of chocolate. I am not sure if the red food coloring adds any actual flavor, but red velvet has a distinct flavor to it. It’s probably just the buttermilk. Hi there! Oh my gosh – red velvet cake – look at that color! I actually saw this Food Network Throwdown special about red velvet cake… and the guy interviewed (cakeman) had the brightest, most Mac Lipstick-in-your-face-russian-red velvet cake. It seriously hurt my eyes to look at my TV. but i have a question: i’ve never tried red velvet cake – but what does it taste like?